1971 DeTomaso Pantera Sales Brochure. 4 page color folder, 11 x 8 inches. 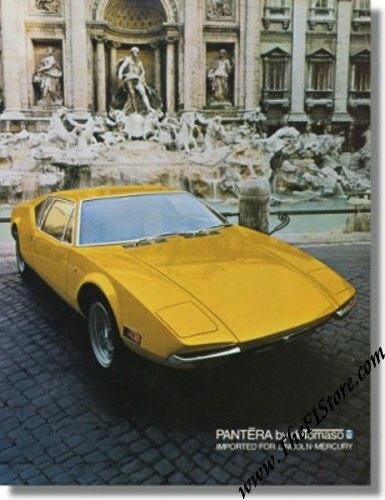 Cover is photograph showing three-quarter frontal view of yellow DeTomaso Pantera sport coupe parked in front of Romanesque fountain. Folder opens to 11x17 photograph showing side view of same car, with discussion and specifications. Back cover has photograph of interior, with discussion. Only 1 available of course.